Alaska Division of Forestry and BLM Alaska Fire Service firefighters continue work on six staffed wildfires across Alaska. Cooler, wetter weather has moderated fire activity around the state allowing work to be completed on several of the fires. Mooseheart Fire (#204) and Zitziana River Fire (#133) — 53,365 acres and 34,380 acres, 144 personnel, 100 miles west of Fairbanks and 8 miles south of Manley Hot Springs, both were lightning caused, Mooseheart on June 7 and Zitziana on June 4. Rain overnight and into Friday morning, coupled with cooler temperatures, significantly moderated fire behavior on both fires, allowing firefighters to make good progress. Firefighters have completed saw work for an indirect fireline, mopped up firelines around the cabins and homes on Kindamina Lake, completed protection preparation for structures on Mooseheart Lake and continued point protection work of Native allotments and cabins along the Tanana River. The Midnight Sun Interagency Hotshot Crew will demobilize from the fire Sunday, leaving the Chena Hotshots; Tanana Chiefs and White Mountain Type 2 Initial Attack crews; along with smokejumpers and the Fire Familiarization Program Type 2 hand crew. Pilots need to be aware that there is a new frequency for the temporary flight restriction (TFR) in place over the Mooseheart and Zitziana River fires. The new frequency is 133.950. The restricted airspace around both fires has not changed. Pilots should go to http://tfr.faa.gov/ to check NoTAMS before flying anywhere in the area. An aerial photo shows the burn scar of the Hadley Fire (#258) on Friday, June 22, 2018. Hadley Fire (#258) – 0.3 acre, 22 personnel, 20 miles southwest of Fairbanks on the Tanana Flats, human caused on June 20. The North Star Type 2 Crew completed their mop up yesterday and will conduct a final grid of the fire today in preparation to demobilize Sunday. 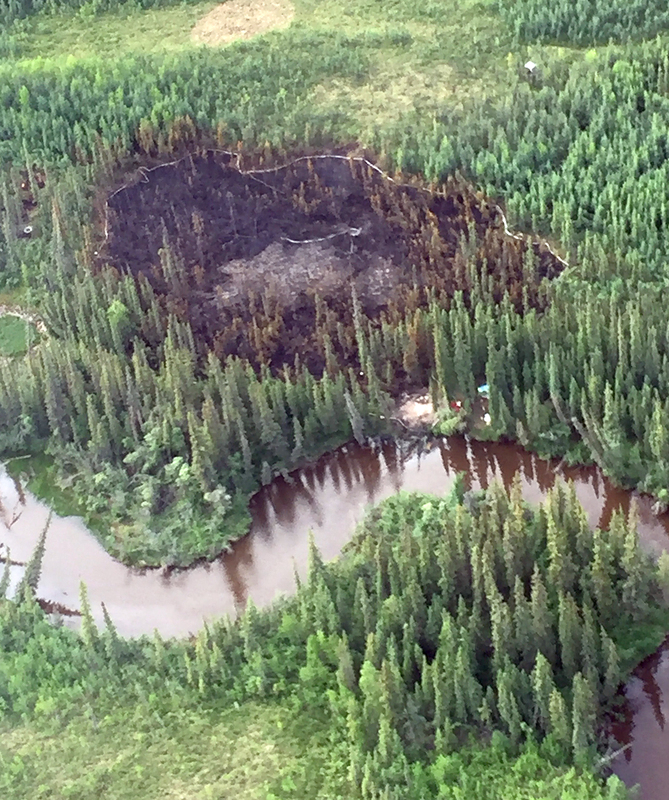 Tatalina River Fire (#245) — 58 acres, eight personnel, approximately 45 miles northwest of Fairbanks and 5 miles east of the Elliott Highway, lightning caused on June 15. Firefighters were kept off the fireline for a part of the day Friday due to safety concerns over falling trees because of erratic winds from passing thunderstorms. They are planning to make a final grid of the fire today in preparation to demobilize Sunday. Louise Creek Coal Seam 2018 Fire (#254) – 763 acres, 54 personnel, 5 miles northeast of Healy, started by a coal seam fire on June 19. The fire remains north of Lignite Creek and east of an old dozer line along Francis Creek that is being used as an indirect line to box the fire in. The fire received light precipitation overnight and the moisture, along with cloud cover, helped to moderate fire behavior on Saturday. Dozers continued work on re-establishing the old dozer line and crews are improving the line by clearing brush and trees. Crews are also plumbing the indirect line with hose and pumps. A helicopter was used for water drops throughout the day to keep the fire from threatening the dozer line. A plan was finalized in the unlikely event fire behavior increases and a burnout operation along the dozer line is required. The perimeter of the fire is 50 percent contained. Tentative demobilization is planned for Monday. Top of the World Fire (#267) – 25 acres, 10 personnel, 8 miles west of U.S.-Canada border, started by lightning on June 21. Command transitioned to a local area incident commander on Friday. The fire was mapped and is holding at 25 acres after smokejumpers worked late into the night. A state forestry helicopter delivered supplies and personnel on Friday. The perimeter is about 10 percent contained and is projected to be fully contained in three days with the current weather outlook. Mosquito Creek Fire (#262) – 3 acres, 8 personnel, 40 miles southeast of Fairbanks and 6 miles northeast of Harding Lake, started on June 20, under investigation. The fire received precipitation overnight Thursday. Smokejumpers continue mopping up perimeter and interior of fire. Some heat was found in the interior. Edges are mopped up 50-75 feet in. Tentative demobilization planned on Monday, June 25.